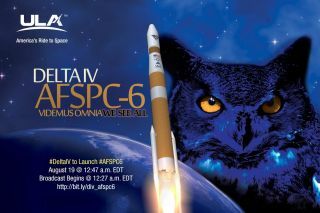 The U.S. Air Force will launch two surveillance satellites early Friday morning (Aug. 19), and you can watch the action live. The third and fourth satellites in the military's Geosynchronous Space Situational Awareness Program (GSSAP) are scheduled to lift off atop a United Launch Alliance (ULA) Delta IV Medium rocket at 12:47 a.m. EDT (0447 GMT) Friday from Florida's Cape Canaveral Air Force Station. You can watch the liftoff live here at Space.com, courtesy of ULA. You can also view the launch directly via ULA, at ulalaunch.com. If all goes according to plan, the two GSSAP craft will set up shop near geosynchronous orbit, which lies about 22,300 miles (35,900 kilometers) above Earth and is home to many U.S. military surveillance and communications satellites. The GSSAP satellites will monitor the goings-on in geosynchronous orbit, observing the movements and activities of objects there, ULA officials said in a brief description of the mission, which is called AFSPC-6 (Air Force Space Command-6). The first two GSSAP satellites launched aboard a Delta IV Medium rocket in July 2014. The GSSAP spacecraft were built by Virginia-based aerospace company Orbital ATK. The GSSAP project was classified until early 2014, and details about the satellites and their activities remain elusive.